Hello and welcome to the 131st installment of the SWD. 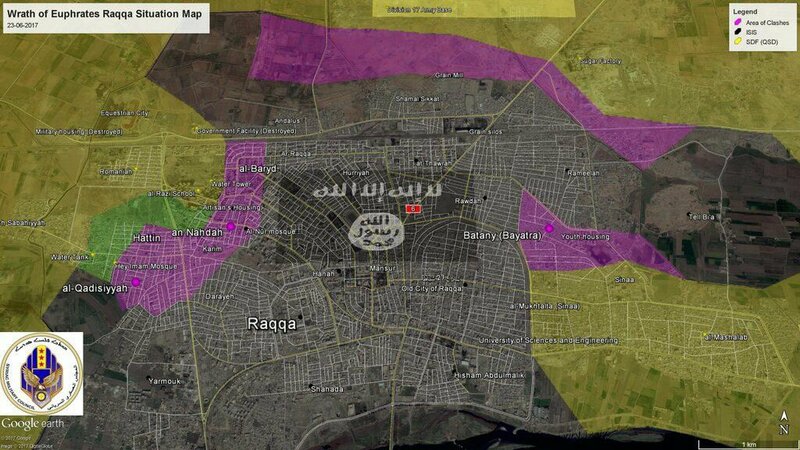 Syrian Democratic Forces are still engaged in heavy clashes with Islamic State in a number of areas in the city of Raqqa. SDF was reportedly able to make limited advances in Hittin, Yarmouk and Al-Qadissiyah districts. One IS’ sniper was killed in Al-Barid district. Islamic State attacked SAA-held Bir Anbaj village, south of Tabqa Air Base. In the attack, IS allegedly killed 20 SAA‘s fighters and destroyed a tank and a BMP, according to Amaq Agency’s statement. Islamic State’s explosive device wounded three SDF‘s fighters in Tel Maarouf village, south of Al-Qamishli. Syrian Arab Army made even more advances against Islamic State in the direction towards Al-Bukamal, localities reportedly captured by SAA today are Ard al-Washash, Sadd al-Waer, and Wadi al-Waer. SAA also advanced against IS east of Arak, capturing several hills and destroying three IS’ vehicles. In the clashes east of Palmyra, Islamic State killed two Hezbollah’s fighters and captured one. The U.S. Department of the Treasury, pursuant to U.S. Executive Order 13224, which targets terrorists and those providing support to terrorists or acts of terrorism, imposed sanctions on al- Rawi and his company, Hanifa Currency Exchange’s branch in Abu-Kamal, Dec. 13, 2016. This was the first U.S. action specifically targeting ISIS-affiliated money-services businesses. The U.S. Department of Treasury designated al-Rawi for providing financial and material support to ISIS. Al-Rawi pledged loyalty to ISIS in 2014 and used his network of global financial contacts to help ISIS conduct weapons and ammunition deals at a time when the terrorist group was seizing land and committing atrocities across Syria and Iraq. In 2015, he facilitated ISIS financial transactions and money storage, including payments to ISIS foreign terrorist fighters; his property was also used by senior ISIS leaders for weekly meetings. As of May 2016, he was considered an ISIS finance emir, whose money exchange business was used for ISIS-related transactions. Syrian Arab Army resumed its offensives on Jobar and Ain Terma by capturing several buildings on both fronts. Rebels claimed recapture of several positions and death of at least eight SAA‘s soldiers on Ain Terma front. Rebels reportedly destroyed SAA‘s tank east of Daraa’s Palestinian camp as the latter tried to advance in the area. Rebel “Daraa Martyrs Documentation Office” reported death of a Free Syrian Army’s fighter due to clashes with SAA across Daraa, and death of two civilians due to SAA‘s shelling of Daraa, confirmed rebel death toll since the 3rd of June is at least 55 fighters. Islamic State’s affiliate, Jaysh Khalid ibn al-Walid, cut the last rebel supply route into Hayt village, thus completely besieging the locality. Until now, Hayt was surrounded from three sides by IS’ affiliate. Iraqi forces and Islamic State clashed in several neighborhoods of Old Mosul district, according to the latter’s media agency, 10 Iraqi soldiers were killed and 27 wounded as they tried to advance in Bab Jadid and Bab al-Bayd neighborhoods. Furthermore, another statement from Amaq claimed death of eight Iraqi soldiers, including an officer and fall of a reconnaissance drone in Bab al-Bayd. Clashes in Bab Laksh allegedly resulted in destruction of four Iraqi Humvees. Heavy clashes were also happening in Al-Mashahedah area where IS claimed to have killed five Iraqi soldiers and two officers. In the same area, according to Amaq, airstrikes wrongly targeted Iraqi forces instead of IS. Iraqi forces reportedly surrounded a group of IS’ snipers stationed at a hospital in Old Mosul district. VBIED exploded in Baghdad al-Jadida, southeast Baghdad, killing and wounding at least seven people. The attack still remains unclaimed, but the main suspect is known to everyone, Islamic State. Another VBIED attack in Baghdad was foiled by security forces, which defused it near the Church of the Virgin Mary. On the 22nd of June 2017 CJTF-OIR has conducted 28 strikes in Syria. CJTF-OIR‘s main focus in Syria at the moment is Raqqa region where they did 19 strikes supporting SDF‘s operations against IS destroying 12 fighting positions, two vehicles, and an IED cache; and damaging an IS supply route. Other areas where nine airstrikes occurred are Abu Kamal (Al-Bukamal), Deir al-Zour, and Palmyra, destroying 15 IS oil stills, four dump trucks, three cement mixers, three vehicles, four IS tunnel entrances, three tactical vehicles, two cranes, a weapons cache, a pump jack, and a manifold. Full report on CJTF-OIR strikes conducted in both Syria & Iraq can be found here. Islamic State’s suicide attack in Quetta, Balochistan province, killed and wounded 15 members of Pakistani police. Thanks for the wrap up pout. Really love having the daily wrap ups back again.